Year 2015 is the 150th birthday of Jean Sibelius. 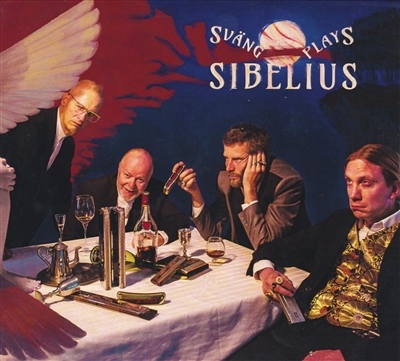 Sibelius is the most remarkable classical composer from Finland. The meaning of his music for Finnish people is much more than only music. Sibelius was born in 1865 the time when Finland was still a part of the Russian empire. Finland separated from Russia and got independent only year 1917, the same year as Russian revolution took place. When we chose the music to arrange Sväng had different approaches. Some of the music is simple songs or choral pieces that are fascinating because of their pure sense of melody. Some of the music is huge orchestral pieces that were just too great temptation to avoid: we love this great music… would it be possible to do transform this for Sväng? And finally the answer was: yes, it is. From the orchestral works Sväng chose Lemminkäinen’s return (part of Lemminkäinen-suite, based on Kalevala), three parts of Karelia-suite (Karelia is the eastern part of Finland where lot of Finnish folk culture is originated), Valse triste, Andante festivo and Impromptu.